I rarely do double posts in a day, as I don't believe that readers tend to appreciate them. Today I am making an exception and doing a brief post, as I would like to suggest a response to some recent comments from Canadian musician and icon Neil Young. One of the comments Neil made when he was in Fort McMurray was saying it looked like "Hiroshima". Now, not only is this an insult to our region but I would say it is an insult to Hiroshima as well, a place that witnessed the kind of destruction that few can imagine. One of my biggest issues with this comment is that Neil did not differentiate between industry and community. And I will be very frank - industry is not pretty. The oil sands sites are not beautiful, but then again I was in a gold mine once, far underground where the "ugly" was hidden from view but there nonetheless. I have been in a pulp and paper mill, and an abattoir - and not a single one was pretty. The funny thing is, though, that the communities around those places were often quite lovely. The gold mine was beneath a small town in northwestern Ontario, a place of stunning natural beauty with lakes and trees and bright northern skies. The pulp and paper mill was minutes from a forest, a deep and dark one with lush green undergrowth. And the abattoir was on the edge of the city where I grew up in Saskatchewan, mere feet from waving fields of grain, an endless horizon, and under a bright prairie sun. That others may choose to do the same with their photos. And as much as I avoid the use of the word "tarsands" in this case I will use it very deliberately, as those who wish to view us as Hiroshima use that word, and I want them to perhaps get a glimpse that it may not be quite what they believe it to be. Currently, I live in Nova Scotia, but, I lived in Fort McMurray from 1980 until 2010. It was my home for 30 years, and, I defend it constantly. I am annoyed by the insinuations that I must be 'tough' to have lived there for so long. I am annoyed by the condemnations of those who have never been there, let alone lived there. I am annoyed by 'movie stars', 'musicians', 'environmentalists', politicians, and others who are so critical of the place that provides income for so many. Thank you for defending Fort McMurray, and thank you educating those who desperately need to learn! One of Neil youngs comments was about the stink in Fort McMurray. I have spent time at Ft. Mac and in Loa Angelese wher Neil now lives and I can tell you that Fort McMurray smells pretty sweet compared to the city of angels. I am a Saskatchewan boy born and raised. a member of my extended family runs a mixed farm that includes hundreds of head of cattle. The cattle part of the operation is definitely not pretty. There is nothing pretty about manure and its stench; the chaff that blows through the air from grinding grain and hay; the ground chewed up by the passage of heavy machinery and trucks. Just beyond the cattle operation are beautiful fields, forests, and a river valley. Industry is rarely attractive and is often ugly from my point of view. However, this cattle operation feeds people and provides work for several individuals.Like Anonymous above I am annoyed with "experts" from a distance who impose themselves into debates. I like the idea of this blog and thanks for the image. I have never been to Fort McMurray, but would love to go some day. Keep up the good work. I really do thank God for you, Theresa, always a voice of reason, and support... UGH! I want to scream and shout because I'm so frustrated and disgusted by all this negative talk about OUR home. 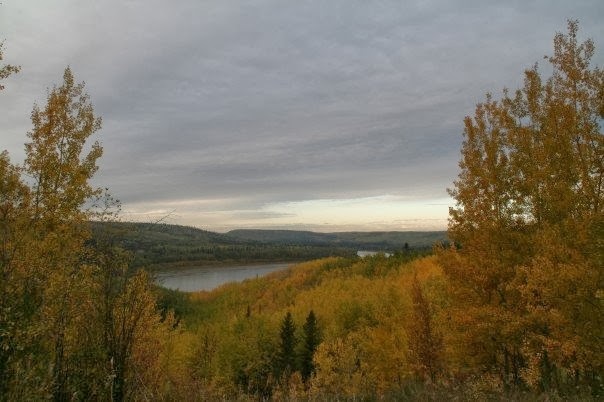 Sure, the oil sands themselves aren't beautiful, but why is there never talk about the extraordinary lengths and research that goes into reclamation? Why doesn't anyone ever want to show the good in this city? My own family, in other provinces, have hopped on Neil and Jim's bandwagons, without taking the time to come here, or ask about the good we do here! They ALL have keys that jingle in their pockets, and they all use many by-products of oil production. Why don't they see they contribute themselves to create the demand, but they are so quick to judge and deem this place as hell on earth? Why can't they see how our industry help the entire country? Thanks for speaking out, for standing up, and for sharing!!! To take it one step further, it would be interesting to see that same photo above being taken today. Has the view changed? I have a picture that I put on twitter of hiking in this same area this past summer. The view has only gotten more glorious and beautiful.